Your pet dog can join in on the fun by being his own cute canine crusader! You don't have to leave your beloved dog at home alone on Halloween night because your pet can also join in the Halloween fun dressed up as one of these cute Batman pet costumes. These costumes also include other DC comics and Batman movie characters like Dark Knight's Joker, Teen Titan's Robin, and classic comic book (grey suit) Batman. These doggie outfits are made for small, medium, or large breeds. Your pet will get lots of loving public attention in the neighborhood and parties when they put on one of these funny Halloween costumes. If you have a couple pet dogs, dress them up as a Batman and Robin duo! Batman's sidekick Robin dog costume includes dog shirt with red chest, Robin insignia, green legs, yellow cape and black mask. A great dynamic duo sidekick pet Halloween costume! The cute pet costume includes the grey jumpsuit with arms, cape, bat headpiece and belt. Available for small, medium, large, and x-large dog sizes. 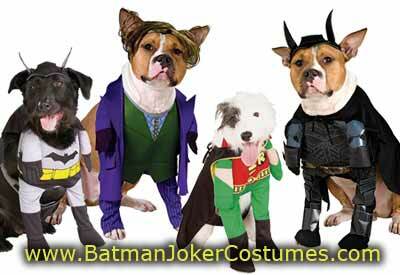 Inspired by the movie Dark Knight, this pet Joker Halloween costume includes front bodypiece with arms, and hairpiece. Available in dog sizes small, medium, large and XL. This pet costume is inspired by the classic grey Batman costume. It features a shirt with detachable cape and headpiece. If you are not sure about your dog's size, here are general measurements for a dog costume. Please note that different pet costume sizes can very slightly so these are not exact numbers. XL Size: Neck 24-28, Front Chest 14-16, Neck to Hem 24, Belly 34-38. There are plenty of discount bargains in stock so browse through all of these deals and don't wait until the last minute. But if you do, most sellers offer expedited or overnight shipping.